I was recently a “guest star” at my daughter’s school and it was pretty special. I had the opportunity to sing and talk about music appreciation with her second grade class. 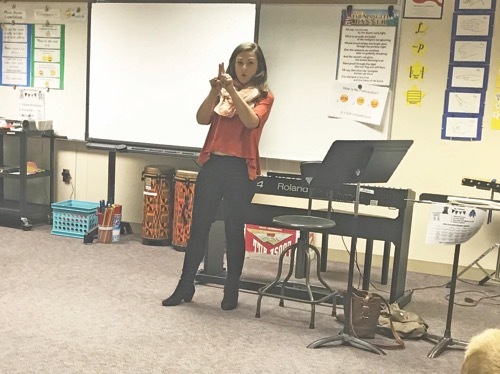 Not only is this awesome because I love being involved in my daughter’s school, but I love teaching kids the importance of learning about all kinds of music and helping them to foster a love of music. I fell in love with music at an early age; I still remember sitting in music class in the third grade and singing along to “Do-Re-Mi” with the most happy, energetic woman you could imagine. She was my music teacher. And it was in those early years that my appreciation for music began to grow. Having her as a teacher would change my life and propel me on a path of music and entertainment — and help me be who I am today. I feel so blessed to now be able to work with music every day, playing positive and encouraging music for everyone. However, for me, it’s not just music at work. Music is a big part of our lives at home — and I believe you can even use music to draw you and your kids closer. Listen to music together in the car. And make sure your kids know they should never feel embarrassed to sing. Sing it loud and proud. Take your kids to the orchestra. We have the amazing Cleveland Orchestra right here in our area. We took our youngest to her first concert at Blossom at only nine months old. Ask them questions during and after the show: What did you like? What didn’t you like? Was the music fast or slow? Loud or soft? Getting your kid thinking critically about music, even if you’re not a musician yourself, is so important in keeping music interesting and fun. Take your kids to see live musical performances. We have one of the largest theater districts in the U.S. right here in Cleveland. Take advantage of it, and introduce your kids to a live musical. Listen to music while you have dinner at home. Have some fun with this one. We play Mexican music when it’s taco night, or Italian music for spaghetti night. You get the point. We always have music playing around our house. Create family “playlists.” Of course this is the perfect time of year to get your holiday playlist together. Let each of your kids put together their favorite holiday songs in their “own” playlist on iTunes, Spotify, or another music source. They’ll love hearing the songs on their playlist play throughout the season. Music is just such a beautiful blessing. I truly believe there is always a song you can sing for anything. When words fail, music always speaks. Not to mention, it also has the ability to transport me back just like a time machine. It lets me revisit lost and forgotten moments in life. I hope my kids always have a love for music and always love and appreciate all types of music. Next article Northeast Ohio Parent Presents Camp Fair 2018 — Win Camp Scholarship Prizes!